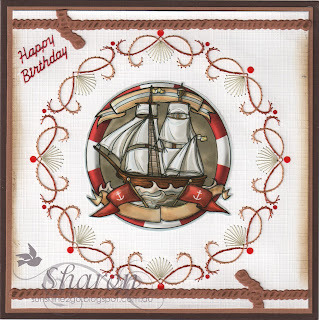 I have created this card especially for my hobby friend in The Netherlands. I have stitched the pattern with Mettler Polysheen 5833. 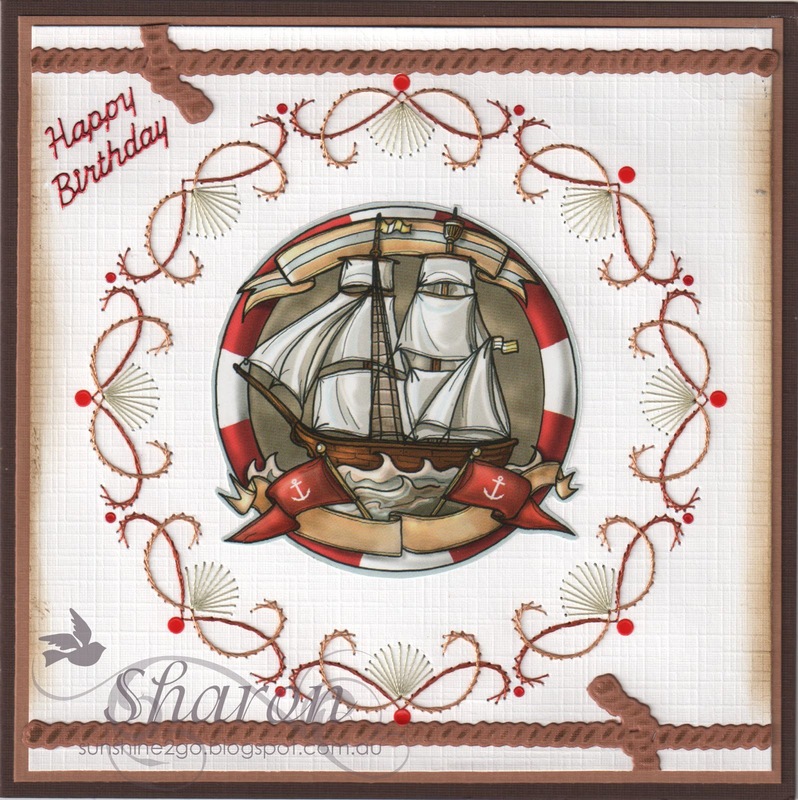 I created the card with a die by Go Keate, Frilly Frame #2, I used the largest frame. 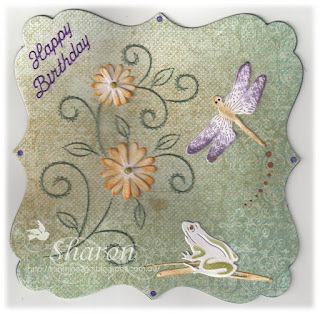 Under the frog I used Sizzix by Tim Holtz 660222. Distress ink - wild honey, dusty concord, peeled paint, brushed corduroy. Happy Birthday sticker coloured with Sharpies. Pearls and Hobbydots have also been added. I hope that everyone has a wonderful week. days have been filled with sunshine although we could do with some rain. This card was especially created for Mark, Petra's husband. Threads are Mettler Polysheen 1335, 2101, 3815. Boarder - Lawn Fawn - Stitched Boarders. Decoupage by Studio Light - Comic Friends. "Happy Birthday" by Darkroom Door - Simple Sayings. My friendship card for the month of June was especially created for Annalie. although this month she was the first lucky lady in our little club to receive her card. Beautiful butterfly pattern by Sjaak. Threads are Mettler Polysheen 0020, 2830, 2910, 5833. Die by Marianne Design, Anja's Oval, MD0376. Oval die by Nellie Snellen MFD057. Flowers were punched with Nellie Snellen FLP027. Background card by Studio Light. "Thinking of you" stamp by Darkroom Door. Distress Ink, Hobbydots, pearls and tape were also added. I hope that every-one is having a lovely weekend. The pattern is by Ann's Paper Art, a106. 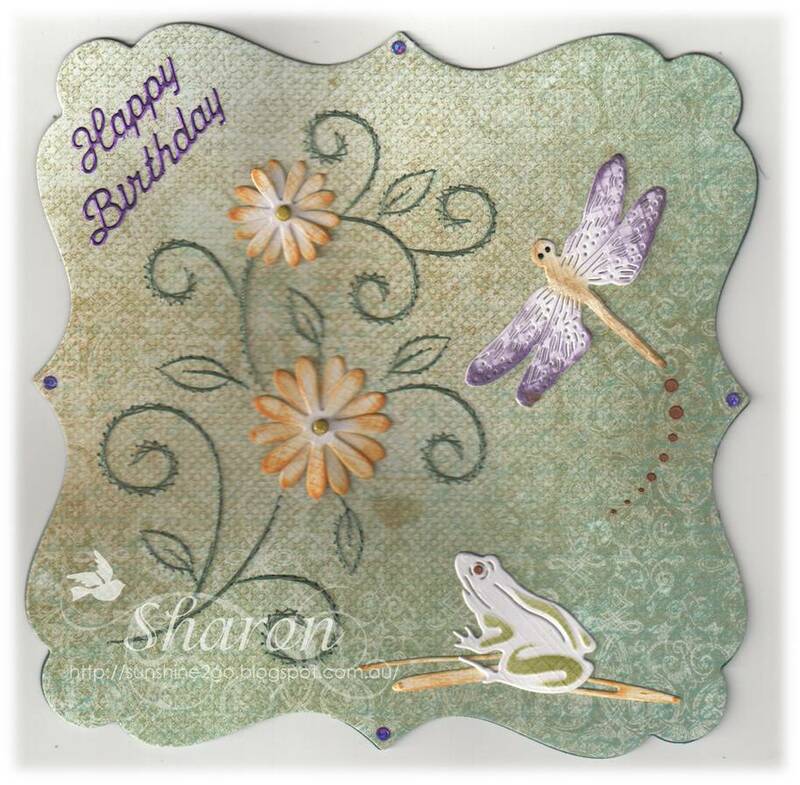 Decoupage by Yvonne Design HJ8601. 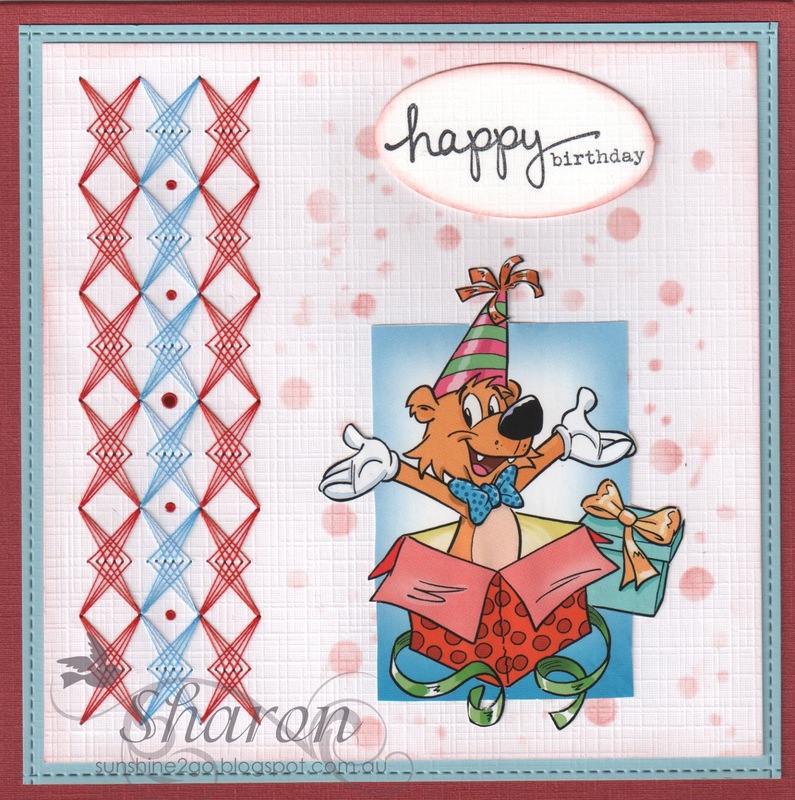 Rope Die by Marianne Design LR0418. Hobbydots and Distress ink has also been added. a beautiful warm day filled with sunshine.